One of the great things about being a Franciscan is that so many of those who follow and love St. Francis of Assisi have been declared saints. Besides the most popular ones- St. Francis, St. Anthony, St. Bonaventure, St. Clare, there are a host of others- who have been recognized by the church as saints and blessed. 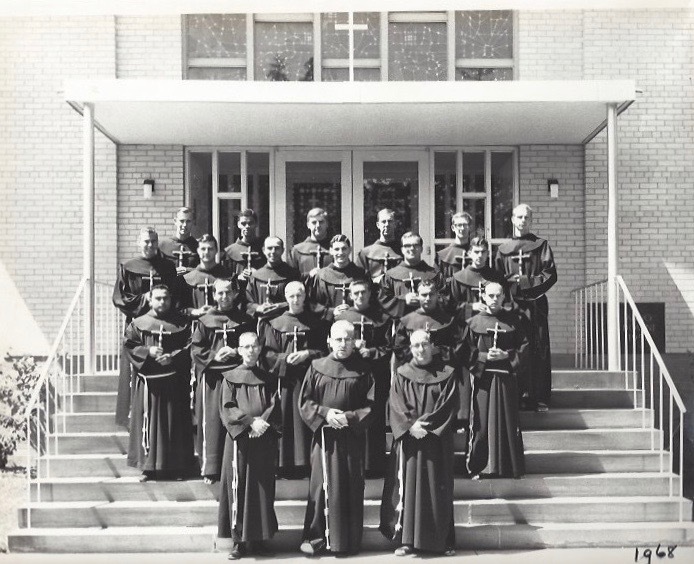 Even more than these, we can think of the countless men and women who, through their devotion to Francis and Franciscan ideals, have achieved great levels of holiness and sanctity. We know that not every saint is recognized as such through the process of canonization. We know there are countless people who have reached the portals of heaven through holy and heroic lives, whose names we do not know, who do not have statues in our churches or feast days on our liturgical calendar. These may even be our own family members or friends, or deceased members of our own Franciscan province. While all of us may owe our Franciscan vocations to those who led us to Francis by word and example, we always can look towards the Franciscan saints who give us so much inspiration. Every month, there are at least several Franciscan saints and blessed who are remembered in our liturgical celebrations. It is important that we look at the lives of these saints as models for our own Catholic faith and commitment to the Franciscan way of life, and seek to imitate them. It is also fitting that, in a few weeks, our Province’s novices will begin their own novitiate year in that same San Damiano friary made so holy, not only by our Father Saint Francis' hands in rebuilding the shrine, but by the presence of Saint Clare and the early Poor Clares. 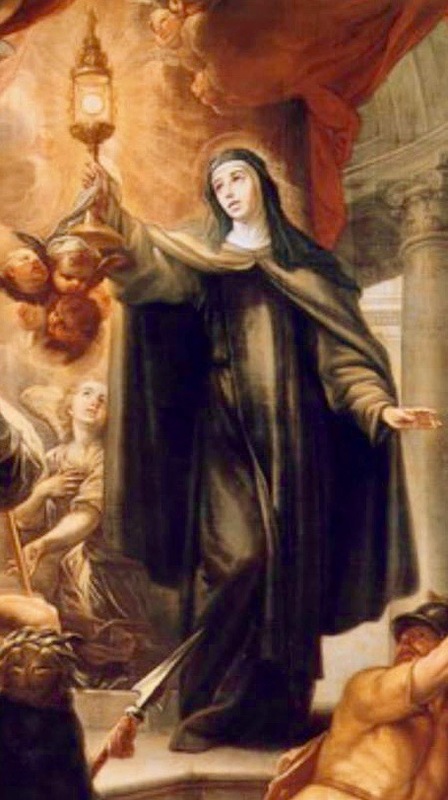 We give thanks for the great example given us by Saint Clare, and we pray that all Franciscans will look to her as a model of Christian and Franciscan virtue. Ourthree postulants (Jack Sidoti from Winsted, Daniel Cavalieri from Philadelphia, and Carl Green from Toronto) are returning to the Convento San Francesco in Rome on August 22, and from August 26 to September 1, will have their pre-novitiate retreat at Monteripido. Then, on September 8, they will be received into the Order and be invested with their Franciscan habits and begin their novitiate at San Damiano Friary in Assisi. 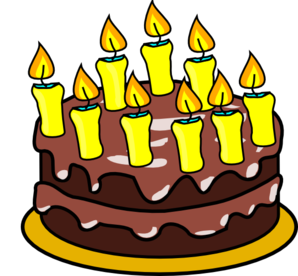 We hope they will be able to continue to give us updates during their novitiate year. Best wishes, Jack, Dan, and Carl. You are in our prayers. 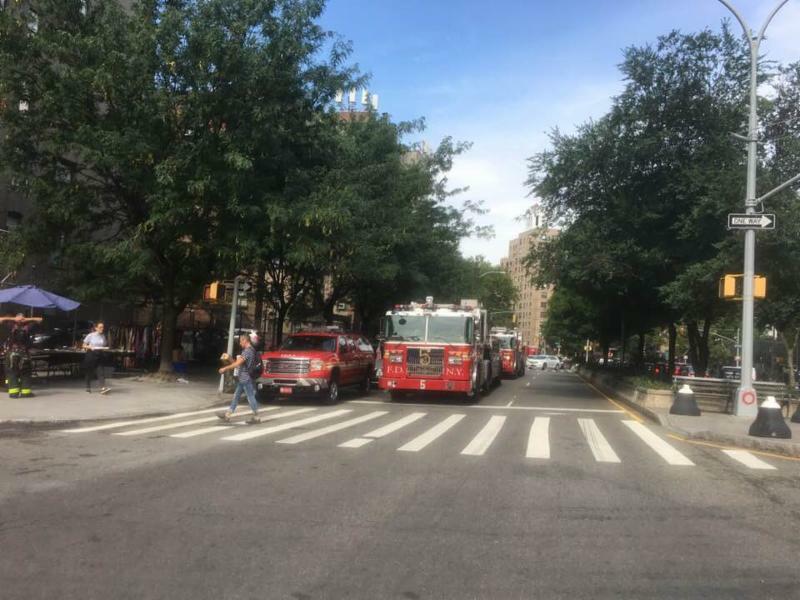 St. Anthony’s and the Franciscans have had a long history of close relationships with the New York City Fire Department. 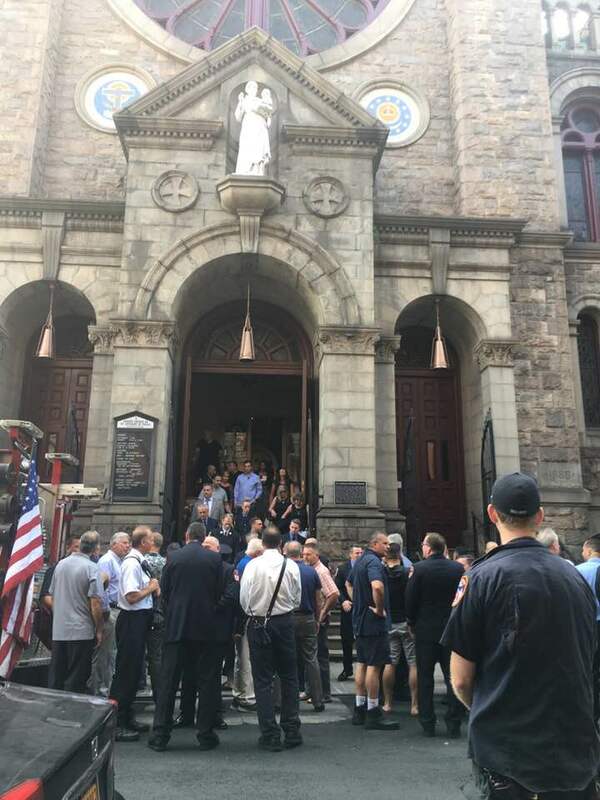 Each year, the community gathers together with the firefighters of Engine Company 24, Ladder 5, of Battalion 2, from the firehouse on Sixth Avenue and Houston Street. 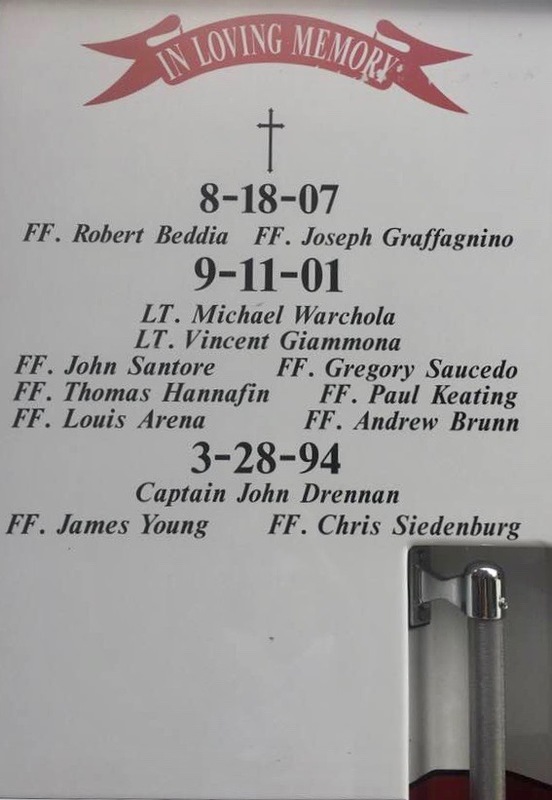 This year a special Mass was again held at the church on August 18 to remember Firefighters Robert Beddia and Joseph Graffagnino, who perished in the fire at the Deutsche Bank building when they were trapped on the fourteenth floor on August 18, 2007. This fire marked another sacrifice on the part of the Fire Department of the City of New York, and on the part of the firehouse on Sixth Avenue, They joined the ranks of the firefighters lost in the national tragedy of September 11, 2001, and three who died in the fire at 62 Watts Street on March 28, 1994. This annual Mass gathered family, friends, parishioners, and firefighters and FDNY staff from all over New York City. We owe much to those who protect us every day, whether it is our firefighters, police, medical personnel, or military forces. Let us always remember them in our prayers. This beautiful piece was written by parishioner and pastoral council member, Joseph Donovan. “Don’t mind them sweetie, they are just lost” said the Mom to her young inquisitive son after they both encountered a Catholic Mass in session at a Beach in New Hampshire in which my family was attending. The Mom quickly diverted the child in a different direction and the Mass continued on without any further interruptions. 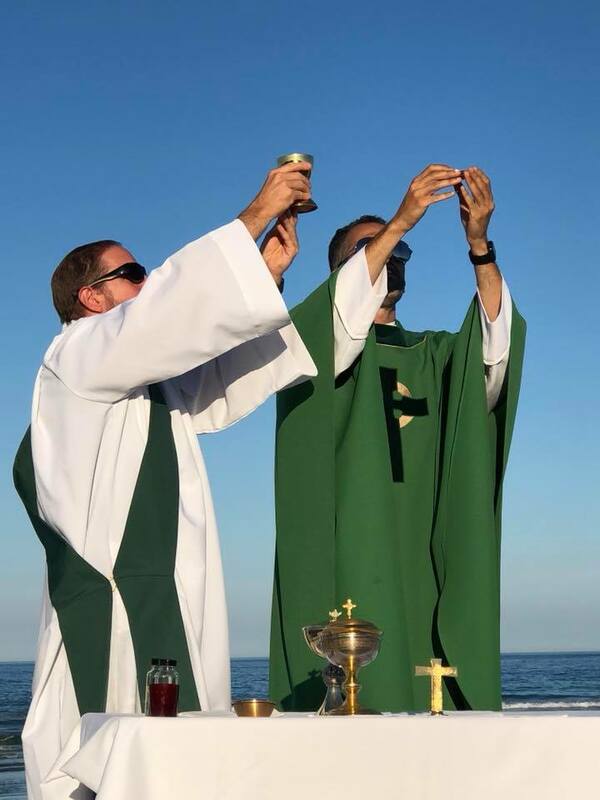 This somber moment did not darken this amazing annual experience that we have each year as our wonderful Parish travels 45 minutes to a New Hampshire seashore to hold a beautiful Mass on the Beach in July. It is a breathtaking liturgy which transforms the amazing landscape of sand and ocean to holy ground of word and sacrament. Our pastor, channeling his St. Francis roots for love of people and nature, has been able to network and grow the event, providing a true testimony in leaving the 4 walls of the church and providing a witness to the world. The parishioners eat up the spectacular setting and after Mass, many will skip happily over to the beach stands where they will gorge on pizza, ice cream, or fried dough! What a remarkable day! Beach, families, friends, food , and of course, Jesus! This event just reminds me that we don’t have to be littered people with grimaces on our faces. As our pastor points out, “We are people of the Resurrection” and hence our evangelization actions should scream out ones of joy and peace! It is historically evident that the DNA of the Catholic Church is one of missionary discipleships and now more than ever, we are called to spread the Good News to the ends of the earth. 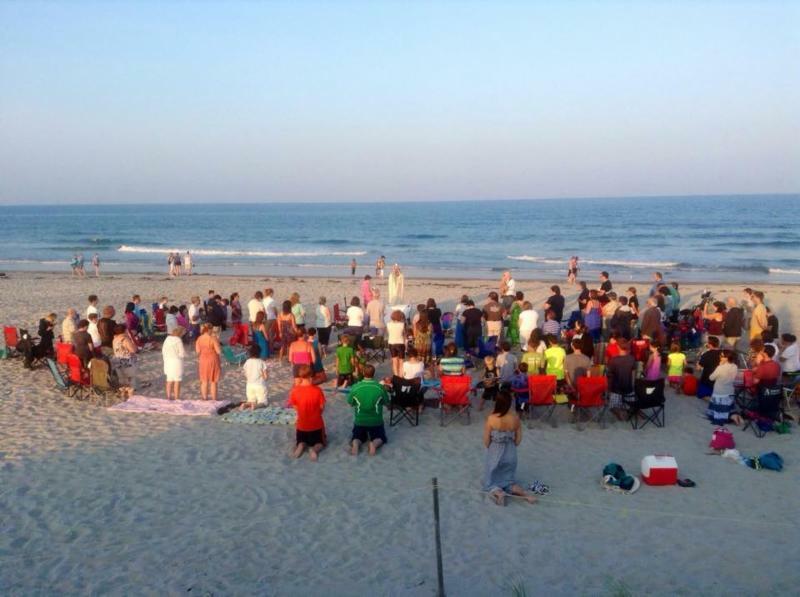 Although on the surface, the beach Mass may not have impacted this mom, it is events like these that help the Church leave the shadow of its own steeple and connect with all people (churched and unchurched) as a reminder to them that there is more to life than this disposable culture. But still, I need to give pause to the woman who claims that we are lost and unfortunately confirm that in many ways, she is right. We as a Catholic institution, founded by Jesus Christ, have succumbed to adversaries narrating our story and retreated when falsehoods and fallacies have reigned. 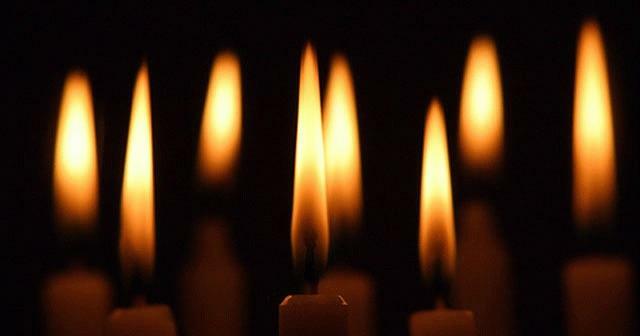 As we remained safe in our sanctuaries, many times we have not allowed the Holy Spirit to change our Parishes or even more so, rekindle the gospel message in our hearts. We either have become stale in our faith, unknowledgeable in truth, hardened toward people, or apathetic towards evangelization change. Still yet, the Eucharist sparkles in the evening sun over Hampton Beach NH and I can’t help but feel complete joy and absolute hope in the present and future of the Catholic Church. There is a growing energy within the Church where the story of redemption and salvation is being recaptured and reimaged. Gone will be the days of empty Sunday pews and with it, a return to complete love for God and neighbor. Next as the Blessed Cup is raised and with the Atlantic Ocean in its backdrop, we surrender to a God where we are confident that everything will be okay as prodigal sons will return home, the lost sheep will be found, and the Lamb of God will continue to redeem the world. So what should have been done with the Mom who said we are lost? Maybe instead of running for junk food after Mass, we should have surrendered to the Bread of Life and allowed us to be spiritually renewed. Maybe if one of us truly had enough faith, the amount of half a mustard seed, we would have pursued that Mom and invited her to this sacred service. Maybe, just maybe, we could have approached the Mom and showed her that the dirt on our feet and knees matched the same filth on hers. Possibly, if we had stronger faith and were not lost, we could have gently guided her to the breaking waves of the shore, where we would have washed her feet and then carried her to the place at the table. Oh, I could imagine the epic celebration in Heaven where one of the Lost Sheep returned home and the lost missionary component of the universal Church was found again. And afterwards for all of us, we could consume large amounts of ice cream which was earthy warranted and divinely received. Thirty-six friars from across the country gathered at Holy Name College, Silver Spring, MD, August 7-10 for four days of prayer, fraternal fellowship, and ongoing formation. This gathering of SPUTY (Solemnly Professed for Under Ten Years) included friars from all seven American OFM provinces. Friar Christopher Gaffrey, OFM attended from our own Immaculate Conception Province. ﻿The event involved outside speakers to provide input, as well as time for the friars to discuss on their own issues in their common life. Dr. Mary Gautier from the Center for Applied Research in the Apostolate (CARA) gave a presentation on changes and trends in American parish life and Quinn Conners O.Carm. provided friars a self-assessment instrument to evaluate their physical, emotional and spiritual health at this stage in their religious lives. John Aherne facilitated discussion of the Revitalization and Restructuring process in the American provinces, giving friars a chance to reflect together on what distinctive role they can play in the wake of the historic vote of May 2018. Friars also looked forward in anticipation to next summer, when the Minister General, Michael Perry, will convene an international Chapter of Mats in Taizé, France. Several friars from the gathering in Silver Spring will travel to Taizé on behalf of their provinces, so our conversations together included time for discussion of the message they would bring on behalf of young friars in the U.S. Guardian Walter Liss and the residents of Holy Name College were gracious hosts for the event, which enabled friars traveling here for the first time to not only see the home of the national postulancy program, but also get a taste of the dynamic multicultural ministry at St. Camillus Parish and St. Francis International School. Jason Welle (ABVM) and Bob Barko (SH) were co-chairs who primarily organized the event. Our Province Retreat has been scheduled for October 14-18, 2018 at Mt. Alvernia Retreat Center, Wappingers Falls NY. This retreat will held together with the Capuchin Franciscans of the St. Mary Province. 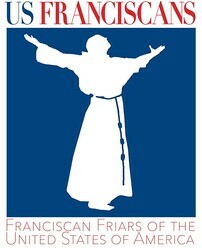 The theme of the retreat is "From Mercy to Mission: Walking with St. Francis into the 21st Century." Retreat director will be Fr. Jack Rathschmidt, O.F.M.Cap. Retreat will be held Sunday evening through Thursday noon. For reservations, contact Fr. Gabriel Massaro: frgabem@aol.com or 845.489.5117. All our friars are invited to this retreat. 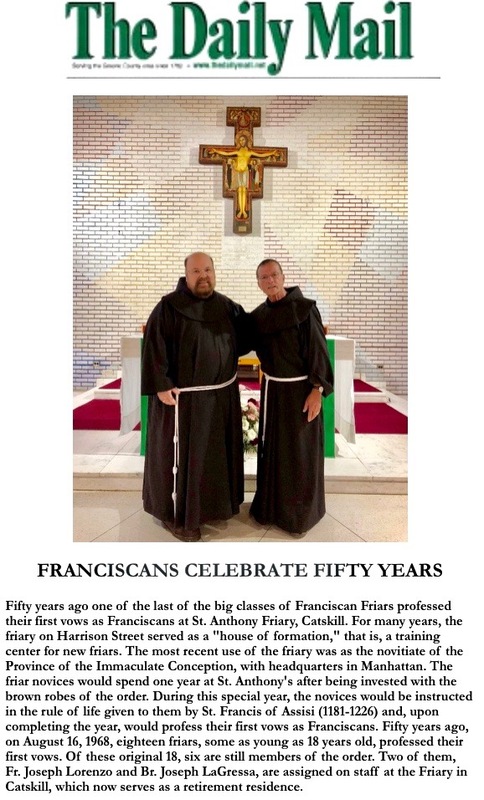 Fifty years ago one of the last of the big classes of friars professed their first vows as Franciscans at St. Anthony Friary, Catskill. 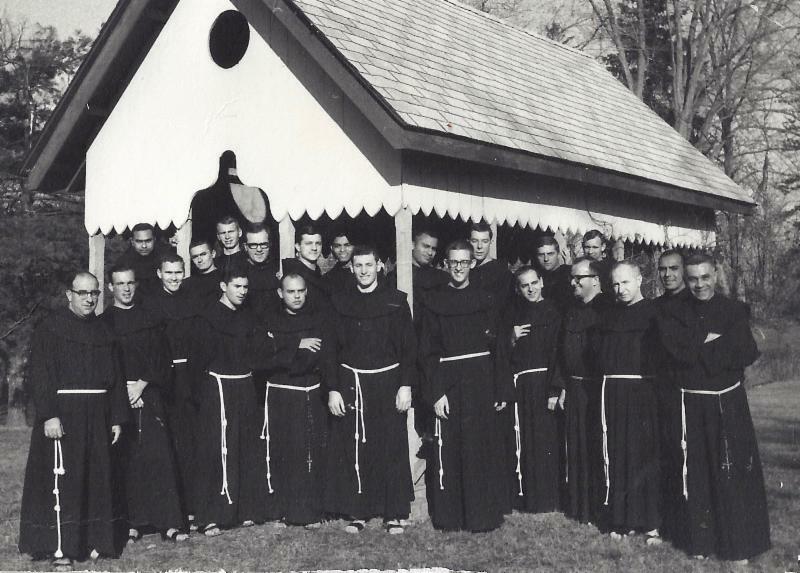 Friday, August 16, 1968, 18 friars, some as young as 18 years old, professed their first vows as Franciscans. On Friday, August 16, 1968. Fr. John Marie Cassese, Vicar Provincial, admitted eighteen novices to the profession of religious vows for one year at a concelebrated Mass in the chapel of St. Anthony Novitiate, Catskill, New York. Fr. John Marie was the principal concelebrant. The homily was delivered by Fr. Bede Ferrara, Vocation Director for the Province. The eighteen newly professed Friars are: Friars James Goode, Rocco Ciandella, Alphonse Ferreira, Lawrence Camerlin, Jack Hoak, Renato Michelutti, Ishmael Ramos, Joseph Lorenzo, Garry James, Winston Evans, Pedro Martinez, Roberto Siguere, Milo Rivera, Levis Alvarez, Martin Baez, Joseph LaGressa, and from the Custody of St. John Capistran, Gregory Horning and Kurt Munn. Of these friars, James Goode, Alphonse Ferreira, Roberto Siguere, Joseph LaGressa and Joseph Lorenzo are still among us. 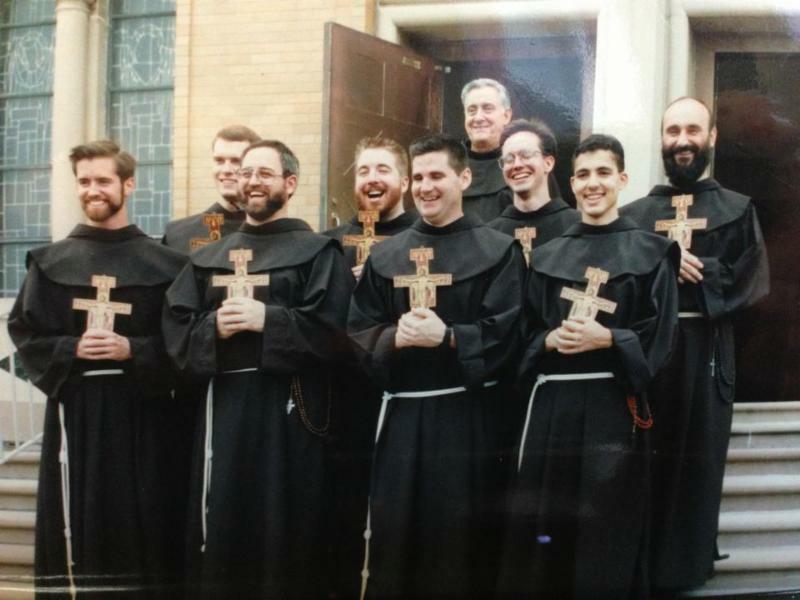 In this photo with the newly-professed are Friar Matthew DeBenedictis, OFM, Provincial Minister; Friar Paul Rotondi, OFM, Master of Novices; and Friar Manuel Tavares, OFM, Guardian. The Minister Provincial is pleased to announce that our Province has been entrusted with the chaplaincy of Ave Maria University to commence this Fall. Friar Rick Martignetti, OFM has been named Director of Campus Ministry and will be moving to Ave Maria in August. The University is giving our Province a four bedroom house on campus for Rick and other Friars who may feel called to campus ministry. 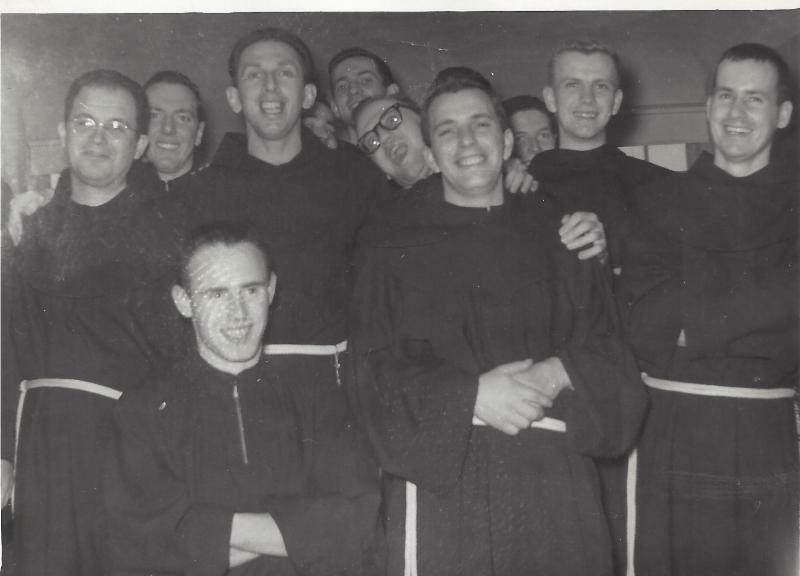 Can any of you identify these friars? A special Liturgy of Thanksgiving will be celebrated at Mount Alvernia to mark the 50 th Anniversary of the Retreat Center on Sunday, September 16, 2018, at 2:00 PM. Mass will be celebrated in the Chapel followed by an outdoor reception. 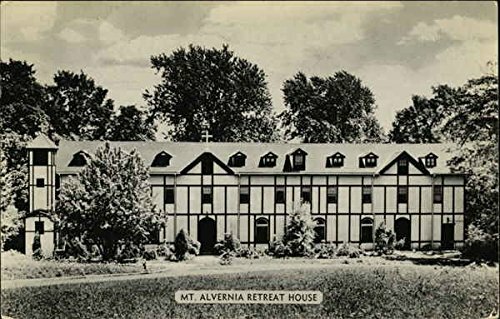 For the last 50 years — since 1968 — the Mount Alvernia Retreat Center on Delavergne Avenue in Wappingers Falls has been the locus of prayer, rest, reflection, lectures, retreats and outreach. Staffed by 5 Franciscan Friars — under the direction of Fr. Thomas Garone, Superior, and Fr. Francis Walter, Retreat Center Director, the friars offer and sponsor liturgical and prayer sessions, monthly, week-end and week long conferences, retreats and spiritual direction. Twice daily the Retreat Center hosts an AA meeting. Twice a month divorced persons meet for fellowship and support. Yearly a group of artists learn — under the direction of an Orthodox nun — the art of icon “writing”. Episcopalian priests and brothers along with Russian Orthodox clergy, Korean Protestants and Chinese members of Cursillo .... come each year to the Retreat Center for spiritual and intellectual renewal. Individuals and groups come from New York, Connecticut, New Jersey, Massachusetts, throughout the United States, Canada, Central and South America, Europe and even Asia (specifically Vietnam). Occupying 245 acres on what was once the Clyde Estate, the buildings and grounds offer a pleasant, restful and restorative area. Maintaining friendly and respectful relations and cooperation with the nearby Buddhist Monastery — the Retreat Center, welcoming all in the tradition of Franciscan hospitality, delights in being one of the “special” and “holy places” in the Hudson Valley and along the Hudson River. 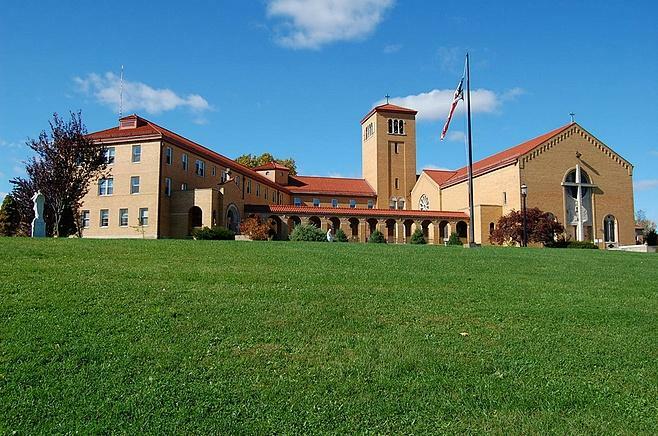 Upon the experimental transfer of the Cleric-Theologians from Mount Alvernia Seminary, the mistaken impression grew locally that the seminary was being closed up. To correct that erroneous idea, Fr. Thomas More Nicastro, O.F.M., director of the retreat house at Wappingers Falls, went on the”Open Line” program of Radio Station WHVW in Hyde Park, NY. He sketched the history of Mount Alvernia Seminary, spoke of the various apostolates being promoted by the different Friars now in the seminary, described the needs of the retreat house and answered questions phoned in to the radio station as he talked. 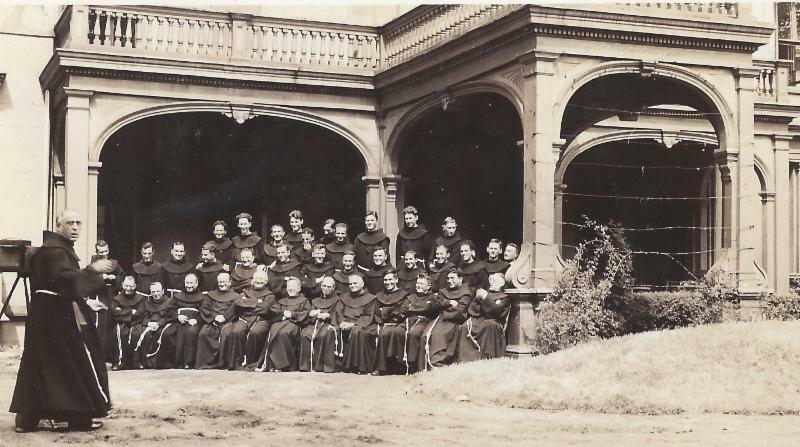 If it did nothing more, Father Thomas reports, it made listeners aware that there was a retreat house at Mount Alvernia Seminary, that there is a need of promoters to foster retreats and days of recollection among the parish societies and other groups, that other valuable programs are also contemplated. Noting that the retreat house is beginning to move along satisfactorily and that considerable interest has been awakened in the Mid-Hudson Valley area, to judge by the letters received requesting information. 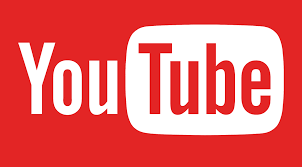 Father Thomas tells of having placed advertisements in the Poughkeepsie Journal and in several other town newspapers, such as those of Hyde Park, Pleasant Valley, Hopewell Junction, La Grange, Fishkill, Rhinebeck, Red Hook, Milbrook, Arlington, Kingston, Beacon and Newburgh. Meanwhile he is currently trying to organize a “Friends of Alvernia” group of men and women who will help with the problem of maintenance at the retreat house, making up of beds, dusting and cleaning, care of the grounds, hosting the retreatants, serving at the table, etc. Both weekend retreats and days of recollection are described in the publicity brochures as “Spending Time with Christ.” Accomodations are available for over a hundred retreatants. High school retreats last three days and may start on Monday, Tuesday, or Wednesday of any week. Adult retreats begin on Friday evening and continue to Sunday afternoon. All schedules are flexible and arranged to conform to the needs of each particular group. They usually include conferences, spiritual reading, common prayer, Bible vigils, discussions, consultations, confessions, Mass, Communion and plenty time for “thinking.” The rosary is recited outdoors, weather permitting, before the shrine of Our Lady and the Way of the Cross is likewise held in the open. Kaci Critchley , aunt of Friar Josh Critchley, OFM, who passed into eternal life on August 16. Sheila Washburn , mother of Friar Thomas Washburn, OFM, who passed into eternal life on July 9.